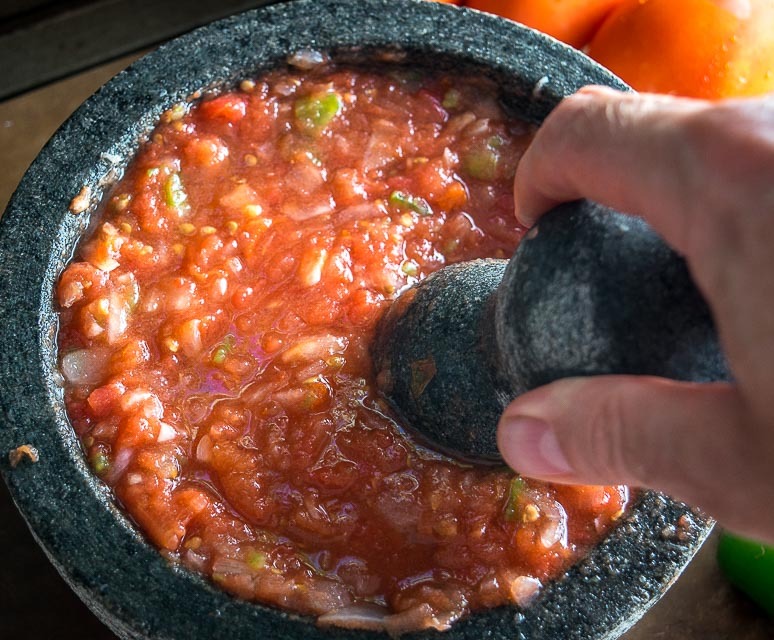 Making salsa with a molcajete will give you a quick taste of civilization missing the mark. Yes, blenders and food processors are massively convenient, but that doesn’t mean they are superior to an old fashioned bowl and club. 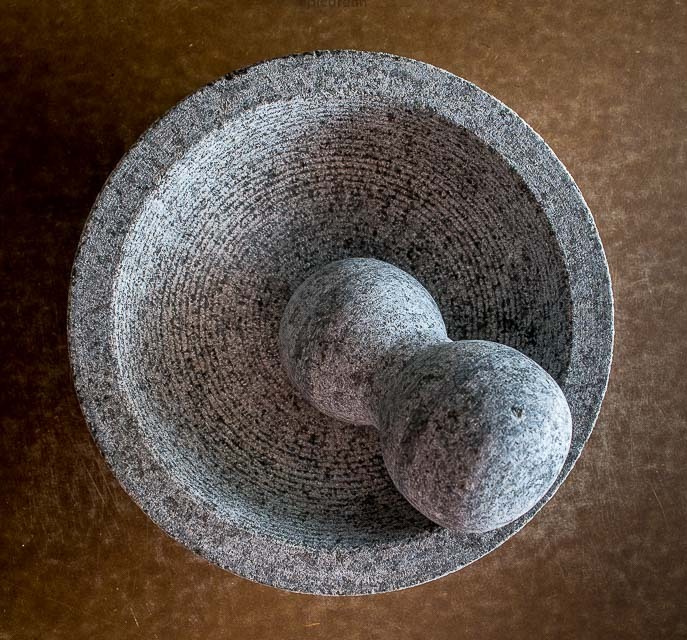 Mortar and pestle would be the more accepted terminology, and if you’re in Latin America it’s referred to as a molcajete. But whatever you want to call it the idea is the same. 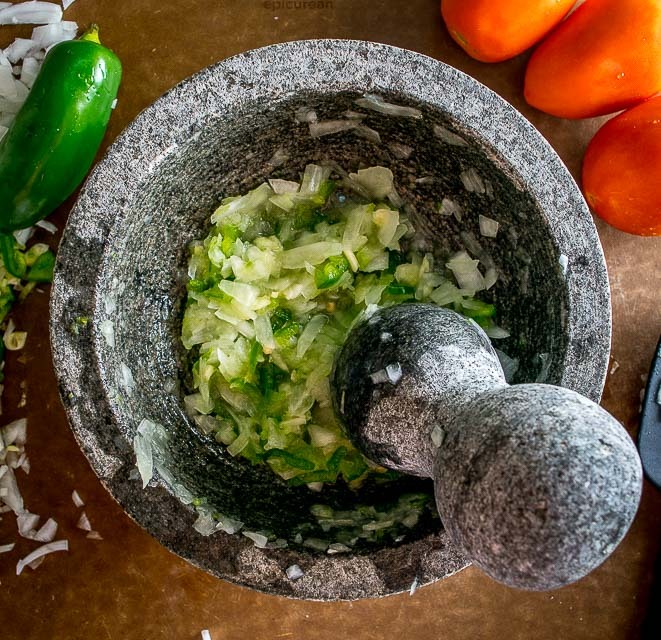 The substantial weight of the pestle makes it easy to grind up whatever you put in the mortar, and that includes ingredients for a salsa that will make your head spin back a few thousand years. Crushing certain veggies will release additional flavors and oils that tend to keep quiet when lightly chopped. It has something to do with certain enzymes being released under X amount of pressure, but the science isn’t nearly as important as the whoa-what-is-this flavor. 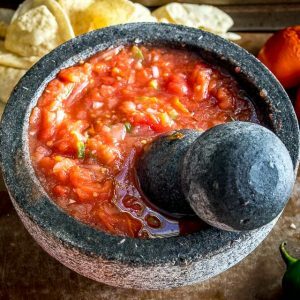 It really is worth trying a Salsa de Molcajete at least once in your life; with minimal effort you can create vibrant salsas that will blow away the store-bought equivalent. To try and persuade you even further, it’s worth mentioning that the apex of civilization (Amazon) makes it really easy to obtain an old-fashioned bowl and club. 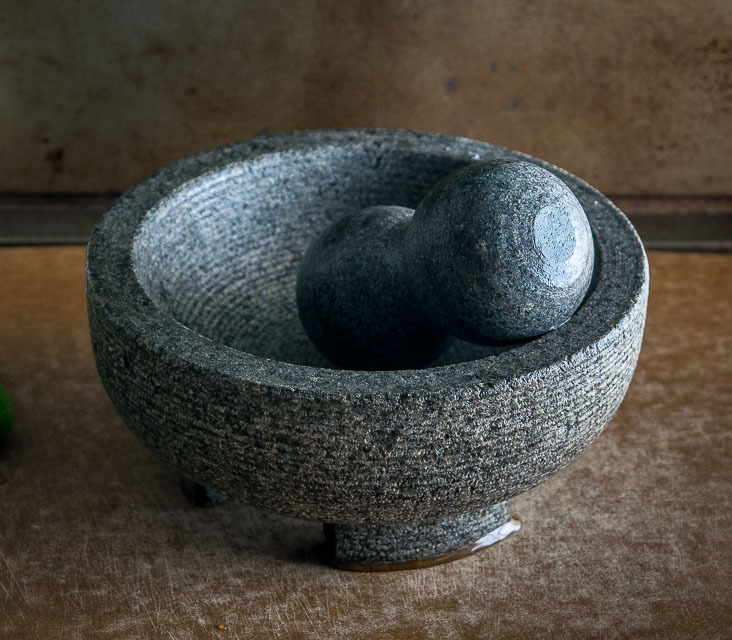 This is a granite molcajete that might not be as exotic looking as those made with volcanic materials, but it does what is asked of it and it only costs 15 bucks. Which is kind of amazing considering that it should last for a few generations. If you’re starting with a new molcajete it’s worth curing it before using it for the first time. Some molcajetes will have a bit of grit escape into your concoction the first time you use them. Grinding up some uncooked rice with a splash of water should dislodge any potential grit or sediment from the surface of the mortar. If you see substantial grit in the rice mixture then rinse it out and do it again. This particular mortar didn’t need much curing as there was no visible sediment escaping, but keep in mind that this will vary. Anyways, once you’ve taken that step you shouldn’t have to do it again and you can move on to more exciting things like Roasted Tomato Jalapeno Salsa. 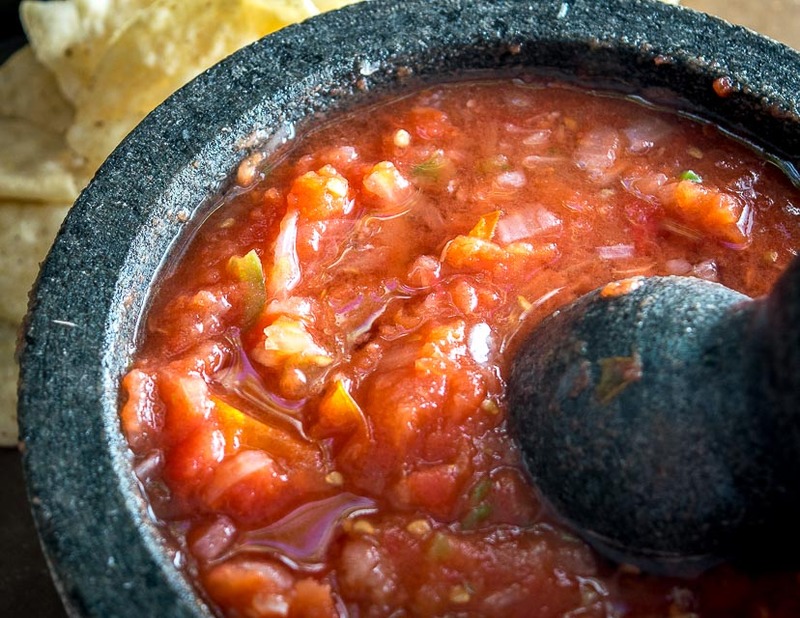 This salsa already tastes great when it’s made conventionally, but when you add in some grinding of the onion and capsaicin it results in an explosion of flavor that might convert your kitchen into a molcajete showroom. Start by roasting the tomatoes. Sure, you can roast them on a skillet or even on a grill, but I usually just put them in the oven at 400F for 20-25 minutes. This seems easiest to me but you are welcome to roast them as you see fit. You might notice more aroma than usual being released from the onions. That’s the science in action! Once roasted, add the tomatoes to the molcajete. If they are properly roasted they’ll be soft and will quickly disintegrate with a bit of muscle applied. If you have skins floating around you are welcome to remove them, but it won’t affect the flavor too much either way. And now the best part…take a taste! You can also add a final pinch of salt here if you think it needs it. There’s one other benefit of molcajetes that companies should advertise a bit more. 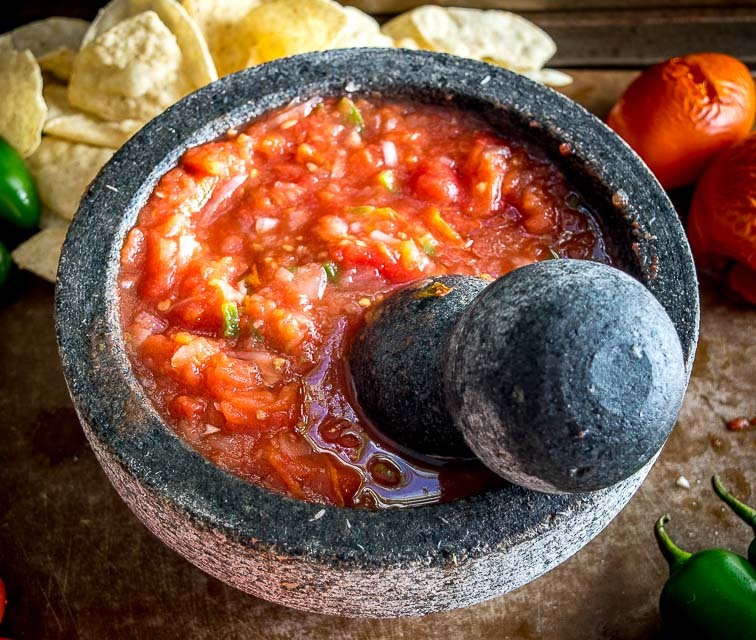 Serving up your homemade salsa in the molcajete itself will complete the time travel back to a few thousand years ago, and your friends and family will be forever grateful for the journey. You can use the comments section below if you have any questions on your mind. It really is worth trying at least once in your life to see how much of a difference you notice compared to conventionally made salsas. P.S. Molcajetes typically rinse out quite well so you don’t have to worry about cleanup being a pain. The less porous versions, like the one we used today, can handle a light scrub with some soap and water without taking on any of the soapy flavor. 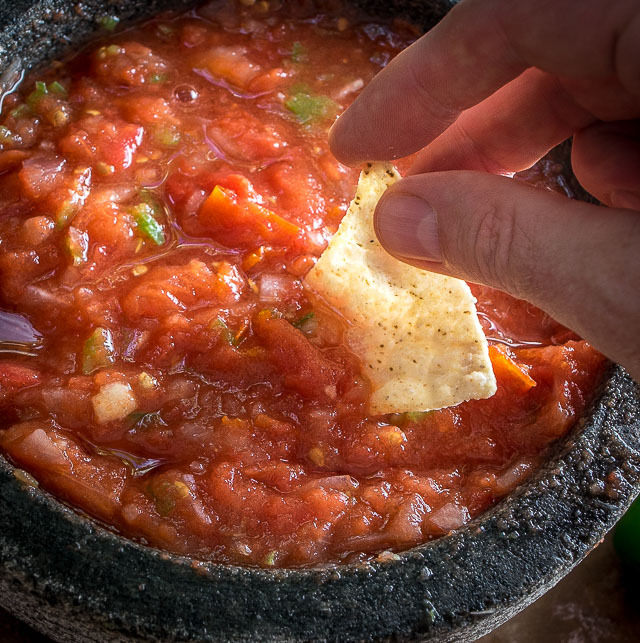 You might be surprised the first time you try salsa made in a molcajete. Crushing the veggies releases additional oils and creates an explosion of flavor that traditional salsas don't have. So good! Rinse and de-stem the tomatoes. Roast the tomatoes in the oven at 400F for 20 minutes or so. Finely chop the 1/2 onion, 1/2 jalapeno, and single garlic clove. 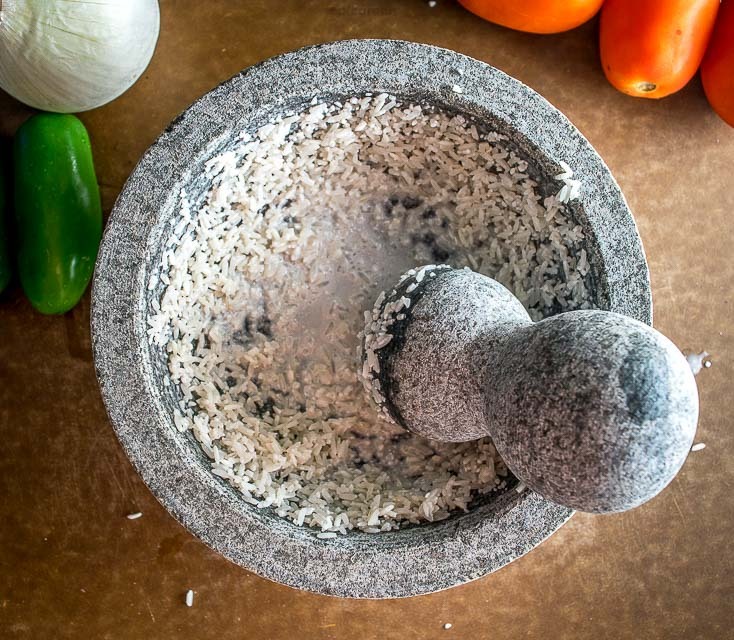 Add these ingredients to the molcajete along with a pinch of salt. Use the pestle to grind the ingredients together. 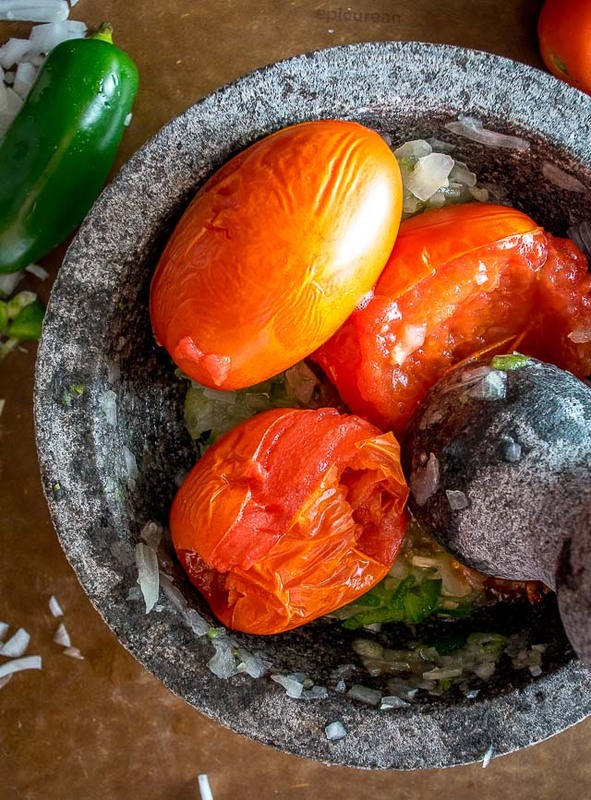 Once roasted, add the tomatoes to the molcajete and combine well with the other ingredients. The first time you make homemade salsa I typically recommend adding the heat (jalapeno) incrementally. I would recommend that for this Salsa de Molcajete as well, so if you want a milder version you can consider starting with only 1/4 jalapeno. I use the oven, but you can roast the tomatoes any way you see fit. I typically do not roast the other ingredients but you can't go wrong experimenting with that. Disclaimer: Yes, there are affiliate links on this page. That means I get a small percentage of the sale if you decide to try out one of the linked products, at no additional cost to you. But my opinion is not for sale and I only recommend products that I actually use and trust. Email me if you have questions about this. Thank you for supporting Mexican Please!! 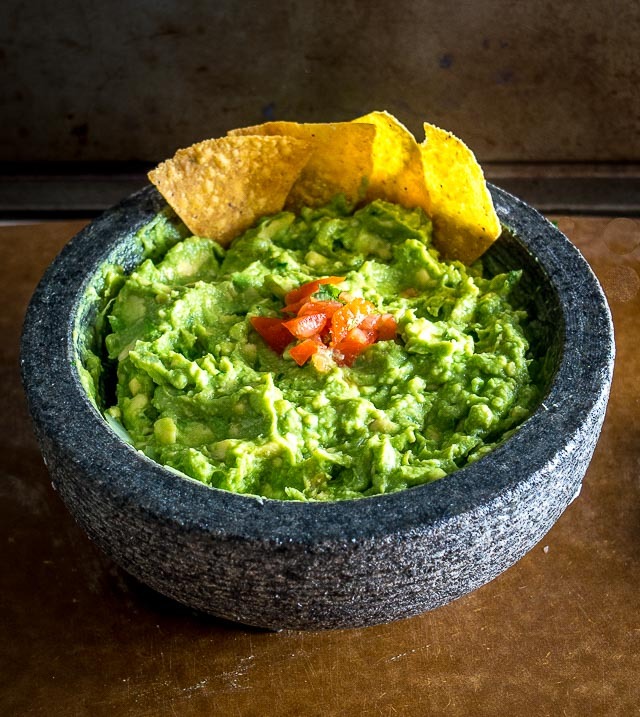 You can use a similar process to make a killer batch of Molcajete Guacamole. 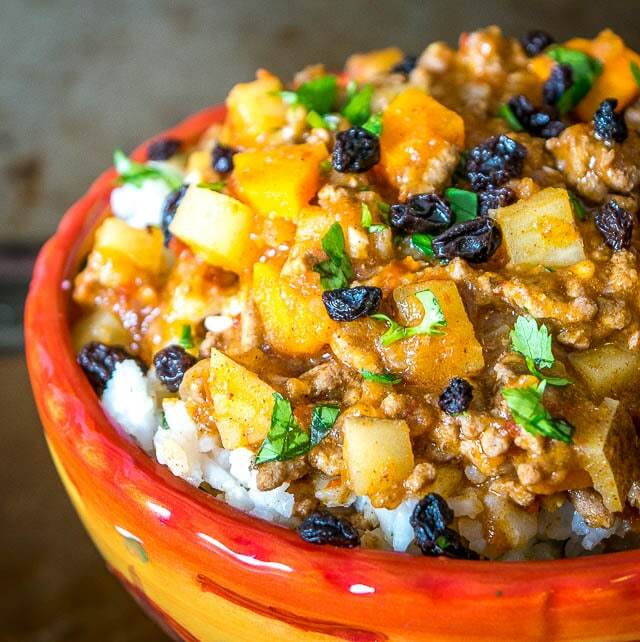 Our latest recipe is this Chipotle Cinnamon Picadillo. Hey Don thanks much for your note! I rarely put cilantro in simple red salsas, but you are right that it is a key ingredient in Mexican and Latin cooking. Cheers. What kind of molcajete is this? From lava stone or granite? What diameter is this one?